The Articles of Capitulation of Quebec were agreed upon between Jean-Baptiste-Nicolas-Roch de Ramezay, King's Lieutenant, Admiral Sir Charles Saunders, and General George Townshend on behalf the French and British crowns during the Seven Years' War. They were signed on September 18, 1759. All 11 demands of De Ramsay were granted by the British Army: the honors of war, the protection of the civilians and their properties, the free exercise of the Roman Catholic religion etc. 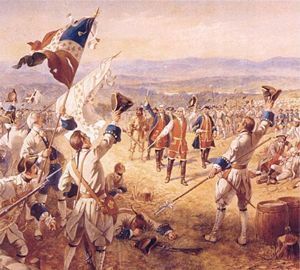 Not long after, the French Army attempted to retake the city of Quebec but it failed (See: Battle of Sainte-Foy). About a year later, the government of New France capitulated in Montreal. The British failures in North America, combined with other failures in the European theater, led to the fall from power of Newcastle and his principal military advisor, the Duke of Cumberland. Newcastle and Pitt then joined in an uneasy coalition where Pitt dominated the military planning. He embarked on a plan for the 1758 campaign that was largely developed by Loudoun, who was replaced by Abercrombie as commander in chief, after the failures of 1757. Pitt's plan called for three major offensive actions involving large numbers of regular troops, supported by provincial militias, aimed at capturing the heartlands of New France. Vaudreuil and Montcalm were only minimally resupplied in 1758, as the British blockade of the French coastline again limited French shipping. The situation in New France was further exacerbated by a poor harvest in 1757, a difficult winter, and the allegedly corrupt machinations of François Bigot, the intendant of the territory, whose schemes to supply the colony inflated prices and were believed by Montcalm to line his pockets and those of his associates. A massive outbreak of smallpox among western tribes led many of them to stay away in 1758. While many parties to the conflict blamed others (the Indians critically blaming the French for bringing "bad medicine" as well as denying them prizes at Fort William Henry), the disease was probably spread through the crowded conditions at William Henry after the battle. In the light of these conditions, Montcalm focused his meager resources on the defense of the Saint Lawrence, with primary defenses at Carillon, Quebec, and Louisbourg, while Vaudreuil argued unsuccessfully for a continuation of the raiding tactics that had worked quite effectively in previous years.